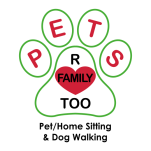 At Pets R Family Too we understand that pets need more care than just visits and walks. That’s why we offer safe and reliable transportation for pets. Getting your pet to the vet safely can be stressful sometimes, especially if they are scared of going for a car ride. Our professional pet sitters are experienced in getting your pet to the vet safely and showing them love and compassion along the way. When we get to the veterinarian or home, we also make sure to give your pet a treat, go for a walk, and provide fresh water if available. This makes their trip much more comfortable and rewarding than just bringing them straight into the office. We also work with pet owners to get their pet to groomers, airports, family, and pet sitting facilities as desired. Think of our transportation service as a chauffeur for your dog that is safe, comfortable, and convenient. At Pets R Family Too, we understand that pets have hard working parents and may sometimes be away from home. That’s why we offer a service which helps pet parents and eliminates them worrying about not having enough time for a vet or grooming visit. With an emphasis on quality, we also have an outlook on safety. That’s why all of our sitters and drivers undergo an extensive background check, as well as various in-house training programs. This insures that all of our sitters are trained properly for any situation that may arise and that they have a good track record. Furthermore, we place great importance on communication. If we are held up in traffic, whether it is before arriving or after delivering your pet to their destination, we will give you a call and update you. Whether you’re looking to set an appointment, or call in for a last-minute request or for an emergency, we are happy to help. Just give us a call and we will see what our availability is. All of our pet sitters are trained in administering pet CPR as well as other first aid procedures. So if you’re ever having a pet emergency and need someone to help or take you to the vet, we are always available.